Photography copyright © Art Wolfe. All rights reserved. 1. As an art student how do you define Landscape photography? I have a very broad definition of landscape photography – it really encompasses just about anything done outside where the subject is that of the land and elements therein. Thus a city skyline is in my opinion a “landscape” image – the elements of the landscape could be man made just as they could be naturally occurring. A rural scene of a barn and wheat fields would qualify. As well as the obvious mountains, lakes and meadows. And I also go further to say you can shoot macro landscapes of the natural world, a minute landscape you could hold in one hand with mushrooms and the debris of the forest can also be categorized as a landscape image in my mind. 2. What are the key elements in a successful Landscape image? The key to any successful image is one that touches the viewer on an emotional level. 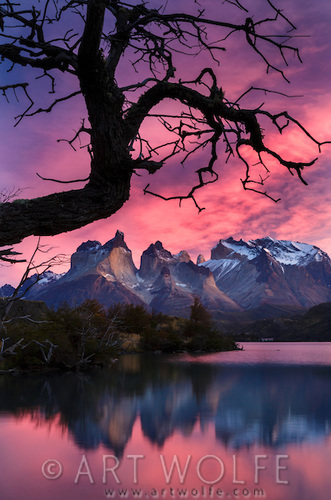 To achieve this in a landscape image generally requires dramatic natural lighting on the land. The so called “golden hours” around sunrise and sunset (and well before and well after those times) should be thought of as golden not just for the color of the light but for the richness of the potential image. Another element to keep in mind is your horizon – it must be level unless you have a very compelling reason to make it otherwise. In general a tilted horizon, even the smallest amount, will register as a mistake by the viewer and ruin an otherwise beautiful image. I’m always amazed at how many images come to me during a critique session with tilted horizons. Secondly get your horizons out of the center – a horizon line down the middle will generally produce a dead image. Either put the emphasis on the sky or the land and move that horizon up or down accordingly – shoot it all three ways and judge for yourself. We hate to give up the impact of the dramatic sky or drama in the landscape, so rather than compromising just make 2 images, one for each. There are occasions where you want the stillness offered by a horizon in the very center, just make sure you’re doing it for a specific reason to make a specific statement. Your choice of lens goes a long way to making a successful image. All too often I see people shooting landscapes with wide angle lenses so they can “include more” in the picture – or telephoto lenses so they can capture a distant peak… Get in extremely close to your subject, just 12-24 inches, and put on your wide angle lens to emphasize the subject while giving it a sense of place and purpose. Then put in your long lens to bring in distant elements in the landscape up close behind your subject, compress the landscape. Well over 90% of my landscape images have been shot with either my 16-35L or 70-200L lenses with the wide angle being my first choice. Lastly the subject. Landscape photography is a difficult subject largely because you are often trying to include so many elements into a single image. Crowd the image with too much and it will suffer accordingly. Fail to give the viewer a pathway for their eyes and they get lost. Simplify the composition, focus on a discrete and obvious subject, hit the viewer over the head with it, don’t force them to try and figure out what you were taking a picture of, make it obvious and in their face. 3. In your view, how important it is, to follow the rule of composition in Landscape Photography? Can breaking away from these rules result in producing some refreshingly unique perspectives or would they confuse the viewer? The rules of photography and any art form have been crafted over time derived from successful images and lessons learned – the better you understand the rules, the better position you will be in to break them. So yes, breaking the rules can result in an eye catching, thought provoking image… but only if done so for very deliberate reasons and not haphazardly. Most of the rules of landscape photography deal with the golden mean and are geared toward producing an image that gives the eye a path to follow, a natural tour through the image from one element to the next. But suppose you wish to really put a single element in the viewers face, to force them to see it and deal with it in their mind. Breaking the rule can give you this result. Other rules say you should never put the horizon down the middle of the image, either implied or real lest you create a stale and dead image. Understand this rule and understand why it works – then you can break when photographing a perfect reflection in dead still waters – here breaking the rule emphasizes the intentional balance in the composition and creates a pleasing image. In general the viewer isn’t looking at images with the rules in mind, they are looking for images that speak to them. Those that invoke an emotional response, that give them pause to think and consider the image before them. Understand the rules and you will be on your way to creating pleasing images… understand them well enough to know when to break them and you will be on your way to those emotional responses as well. 4. How important are colours in landscape photography, according to you? 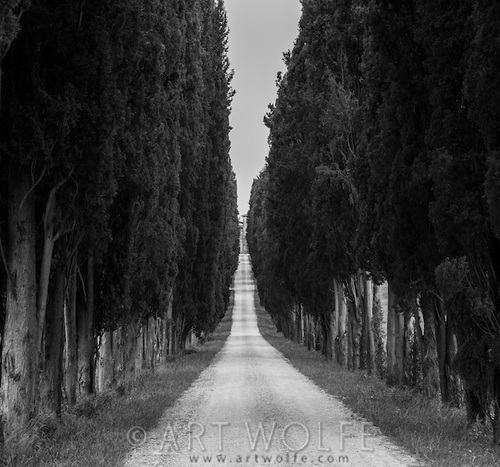 Can monotone LS images be as effective as LS images containing dramatic colours? Whether an image is color or black and white has little to do with the potential impact an image can have. I have equally powerful images in both color and monotone and will continue to create images at both ends of the spectrum. 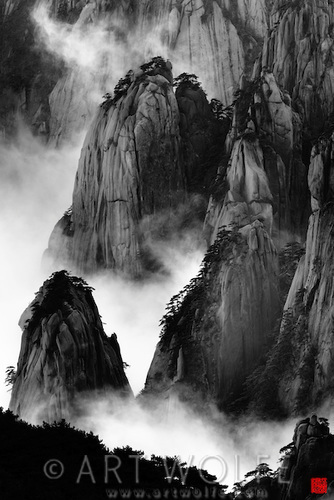 At times color can even get in the way of a good landscape, where the light isn’t particularly spectacular rendering the image in black and white and adjusting the tonality can be just the thing to create a compelling image that draws a person in. In black and white you have many advantages in post production. Here images can be much darker, moodier, adjustments more radical than they could ever be in color allowing you to bring forth a mood that may otherwise not be possible or present when the same image is rendered in color. On the other hand some scenes lend themselves to color – photographing in Bodie, California last year the soft pastel colors of the lupine combined with the light greens in the trees and the pale tones in the straw made for a wonderful painterly scene that would be lost in a single shade of gray rendered in black and white. 5. Seeing the unseen images is one of your strong points, how easy is it to spot such unseen images when making Landscapes? Seeing the landscape with different eyes takes a lot of practice and thought and is an ever evolving process. I studied art and art history in college and thus over the years have wired myself to think more like a painter than a photographer. In fact in my teens and twenties I always assumed I’d be an art teacher doing my paintings in my own time, it was only later that photography came to the forefront. So when I look out at the landscape I have the lessons learned from the great masters of painting on through to contemporary artists. Within a scene I may see elements of a van Gogh. I may see in the textures of a landscape with falling snow a pointillism painting. In the patterns of nature I may imagine something which could have inspired M.C. Escher in his drawings where one figure morphs into another. 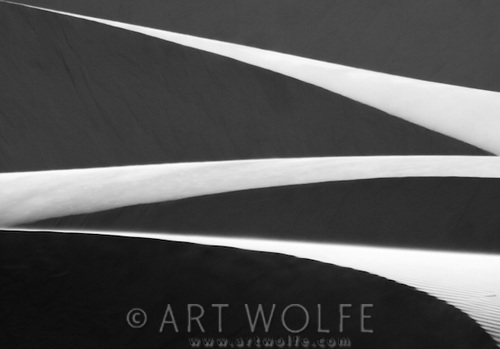 Just as a painter reflects on positive and negative space I do the same as I compose and create images in the field. My choice in point of view, lighting, focal length, elements to include or exclude are all influenced by years of thinking as a fine art painter. So the answer is there are no easy shortcuts to spotting the unseen image. I continue to see images today I would never have seen just a few years ago as my own vision evolves. I often suggest to my classes that for every book on photography you study, pick up one on art history and art appreciation as well. Take a class on drawing or sculpture, broaden your focus beyond just photography to encompass all of the arts and your vision of what is possible will broaden as well. I have taken on this challenge in my classes trying to help people to begin to see this way, to introduce them to seeing the world through a different set of eyes. Some students have taken my seminars and workshops numerous times and they tell me they gain more each time the attend. You won’t get it all in just one dose, it’s a way of life, a way of seeing. 6. There is so much that has changed in the world of photography and nature. In your last 30 years of Photographic experience(s), if you look back as a photographer, do you enjoy the past or the present? And Why? I am definitely a person of the present, I don’t look back and dwell on the past or long for the days gone by. I am into the here and now. Once a trip is over and I’ve returned home I’m thinking about the next one. As photography has evolved it has opened up entire worlds for people, myself included. In the days of film 100 was considered really fast film and 25 or 50 was the norm. You had to work on your panning techniques knowing you could never stop the action and you could forget about shooting on the margins of the day when it came to wildlife. I am loving my new Canon 1DX with acceptable ISO performance up to 6400 and beyond. I found myself in a small boat on a river in Brazil hand holding my camera with a 70-200L photographing jaguars in evening light this past summer, that simply would not have been possible even just a few years ago. So yes, I love the opportunities afforded by the ever advancing digital technology – and coming next will be smaller and lighter outfits, mirror-less cameras with DSLR performance, I’m sure to embrace those as well, anything to lighten my pack would be a good thing in my opinion (so long as the image quality is there of course). The impacts are not nearly as dramatic with landscape photography, I continue to use a tripod with landscapes thus the high ISO performance is moot. However the ability to apply digital ND grads in Lightroom that follow the line of a ridge vs. solely in the field with a straight line glass plate is significant The ability to shoot a RAW image and then later render it in black and white, applying various colored filters and combinations allows for creativity you could never have achieved with film. So yes, I embrace the changes and look forward to what’s coming next. 7. You teach and lead a lot of workshops, what is that one common factor that is missing among young photographers of these days that you would like to change? How do you ensure the participants improve on it? Composition. Pure and simple. No matter how good cameras get, no matter how much Photoshop or Lightroom techniques you apply, you simply can’t make up for bad composition. I see it over and over again. Overworked images that were simply bad to begin with and there is no recovering them. For that reason that’s 90% of what I teach in my workshops – how to see the world differently. I draw upon my experience as a fine art painter and student of art and introduce people to the masters and contemporary artists and their work. What made their images successful and last over the centuries are the same elements you find in excellent photography today. I show my students how I drew upon the inspiration from Matisse and Monet, Mark Toby and Jacob Lawrence when creating my own compositions in the field. When they start to look with new eyes, to see the world differently, to photograph flowers such that they don’t look like the seed packet they came from, then they are learning to see with new eyes. 8. 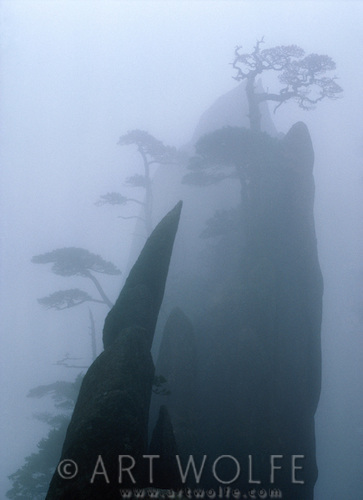 Most of your significant landscape photographs have been from Europe and US regions. 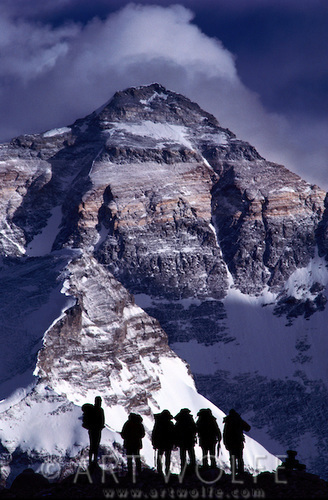 There is relatively lesser number of images from the Himalayas of Indian subcontinent. Is there any particular reason? I was given some very ‘bad’ advice early on in my career. I was told that India had very little to offer the likes of me and thus I didn’t make my first trip to the country until well into latter half of my career. Big mistake. I love India and since my first trip there I have gone back nearly every year even attending the Kumbh Mela celebration 4 times now. I have also traveled and photographed in the Himalayas on several trips, specifically going after the elusive snow leopard and plan to return in early 2014 as well. As time goes on my style has changed, what I’ve gone after has changed, much of my early work was with the classic mountains and nature scenes and though that is what I am perhaps most famous for in my portfolio (well over a million images) you’ll find a good representation from all over the world with healthy selection from India, Pakistan, the Himalayas as well as China, Mongolia, Tibet etc. I am just considering a trip to southern India as I have done a lot of exploring in the northern part of the region and look forward to seeing more of the country. I love the color, the smells, the culture, everything India has to offer. 9. Tell us about your “Travels to the edge” series – how did it all started and your thoughts about it and how it has helped you being a part of a series like that? Travels to the Edge was an itch I wanted to scratch. I had done over 50 books by the time the series came about and nearly 100 to date, books allow me to share my images with greater audiences and creating a TV show allowed me to expand that audience all the more. I am a staunch conservationist at heart who has had the good fortune to see more of this planet that most people ever will and I want to share the cultures, wildlife and beautiful landscapes with as many people as possible. Once informed of what is out there hopefully they will have a more difficult time turning their back on it. I would love to continue the Travels to the Edge series and if I’m able to find some new funding for the show I intend to do just that. 10. Can you walk us through one of your favourite images which is close to your heart and the story behind it? One of my favorite images that has been hanging in my own home for years now is that of a pilgrim crossing the Ganges in the early morning. I scouted the location the day before, made note of where the sun was rising and the time and arranged to be there the following day a good hour prior to the sunrise to create the photograph. I didn’t just happen upon a person in a boat getting ready to leave and snapped their photo, images like this take a lot of advanced planning and consideration. I met with a local the day before and through an interpreter arranged to have them meet me with their boat the following day. For the shot they had to remain perfectly still (this was before high ISO digital cameras) with their hands on the oars ready to row but without disturbing the water. It was not an easy shoot for the subject as everything had to be staged prior to the sunrise and then held as the sun came up through the haze on the horizon. Once the sun broke the horizon everything seemed to move at an accelerated pace, there would be no time to re-position, try a different angle, the sun was on it’s way up and I had seconds (Ok maybe a minute or so) to get the shot. I had actually pulled the bow of the boat into the mud to hold it in place for the shoot as well. 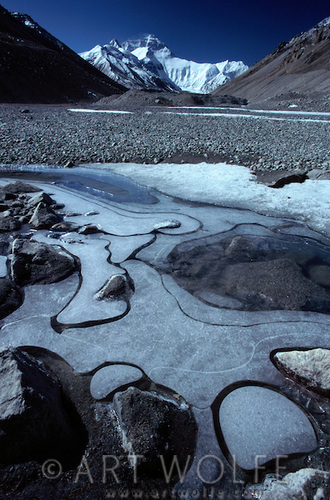 The waters of the Ganges have long been regarded as purifying and sacred among the Hindu religion, due largely to the fact that the river originates high in the nearby Himalayas. 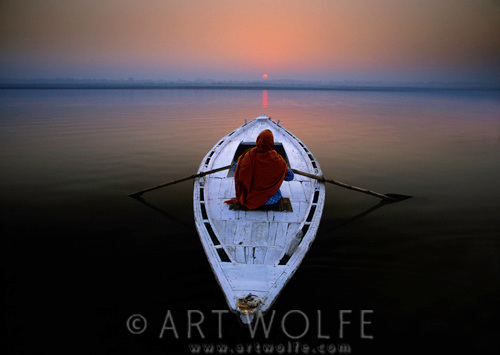 In this photograph, a pilgrim sets out upon the Ganges as the sun rises above the distant shore. In the end “Spiritual Journey” is one of my favorite images, I love the fact that you can’t see the subjects face and there is nothing to indicate whether it is a man or a woman, this allows the viewer that much more of an opportunity to loose themselves in the image, to not be distracted by their own journey had they known the gender. The stillness of the water, the perfect reflection of the sun and just the right amount of haze on the horizon all came together to make this image a success. 11. If Art Wolfe is not behind the camera, how would he like to do to spend his ideal day? When I return from a long stint in the field you will always find me in my garden the very next day. I have personally cultivated an elaborate Japanese style garden at my home in West Seattle inspired by the fantasy like landscapes of Haung Shan China. Working in my garden, tending the plants, the bonsai trees, blowing the fallen needles off of the mosses, keeping the streams and waterfalls flowing is my form of therapy. It’s almost like a mediation. Yes it’s work, but work that I enjoy and one that brings me great rewards with my own personal landscape that I get to enjoy every time I come and go from my home. 12. What’s in the bag? On a typical Landscape photography outing. More important than in the bag – is what’s on the outside of the bag – a really good tripod. It must be stable enough for the equipment you are using and light enough that you won’t hesitate to bring it with you, always. Yes today’s cameras allow for much higher ISO settings but much of landscape photography is done on the margins of light and often well past sunset – a sturdy, light weight tripod is a great investment. And aside from just holding your camera still and allowing for mirror lock up it slows you down to think through your composition checking all 4 corners of the frame for distractions before you hit the shutter release and move on. The best place to find mistakes is in the field, not in post processing. Inside my bag I have evolved to travel lighter and lighter as the years go by. I will forgo a 2.8 lens in favor of a lighter 4.0 if the quality trade off is not too great. With landscapes 90% of my images have been shot with either the 70-200L 4.0 or the 16-35L 2.8 from Canon. On occasion I’ll bring a wider angle lens, a fish eye, maybe a 14mm lens, but it’s not in my “standard pack”. I’ll also bring a set of extension tubes to allow me to use the 70-200 as a macro lens, not for 1:1 macros but just to get in close on ice and patterns and work the intimate landscapes as well. What you won’t find is a flash unit in my standard pack. About the only area you may find me shooting with a flash in landscapes is when shooting stars at night and I wish to light up some foreground elements though here I often use a flashlight rather than a camera flash. Lastly glass graduated ND filters from Sing Ray are always in my landscape pack and have seen a lot of use over the years. Much of what they did in the past can be done, often better even, in Lightroom, but where the difference in exposure is too great I find having the ND filters is still the way to go. I’ve even been known to stack several of them for up to 4 stops when photographing directly into the sun – you wouldn’t’ be able to pull this off in Lightroom alone with a single exposure and in that instance I was photographing moving birds in the landscape thus multiple exposures, HDR, was not an option either. 13. What’s your favourite place which you have shot or have planned to shoot? I love going to South Georgia Island and would prefer this to Antarctica any day. The animals on the island see very few people these days and therefore don’t have a built in fear of man allowing you to get very close intimate portraits. The landscape also holds wonderful subjects whether the natural rolling hills or the decaying villages left behind from whaling years ago. And you find an interesting variety of animals, whether native albatross or elephant seals or the feral reindeer introduced by the Europeans as an alternative to whale meat. Lastly you can photograph King, Gentoo, and Macaroni penguins on the island without the long crossing to Antarctica and the bitter cold. 14. Finally, 3 most important pieces of advice you would like to give budding Landscape photographers? Follow your passion and develop your own style and along the way don’t get too caught up in trying to make money. I compose images that interest me, if I only shot things that I thought I could sell or make money from it would be a very boring “job” for me (yes that that point it becomes a job) and I’d only have maybe 10% of the images I have today. Your passion will lead you where you need to go and it will evolve along the way. My style of shooting continues to evolve, I continue to learn and adapt and through self critiques improve on my images. I’ll create compositions today I never would have seen just 3 or 5 years ago. Scenes I would have walked past back then and not recognized the potential therein. Keep evolving your style. Be inspired by other photographers but don’t try and merely duplicate their work, improve up on it, put your own spin on the subject, make it uniquely yours and keep photography as an art form moving forward not just taking the same pictures with better equipment. 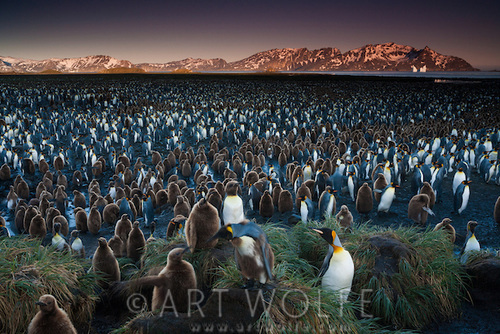 Over the course of his 30-year career, photographer Art Wolfe has worked on every continent and in hundreds of locations. His stunning images interpret and record the world’s fast-disappearing wildlife, landscapes and native cultures, and are a lasting inspiration to those who seek to preserve them all. 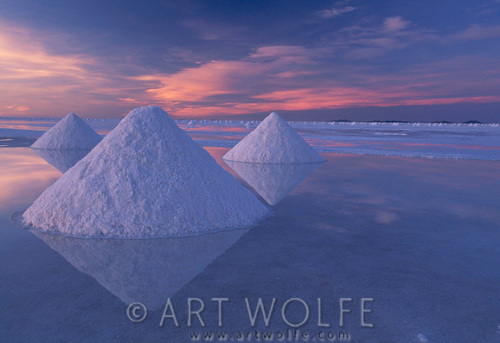 Wolfe’s photographs are recognized throughout the world for their mastery of color, composition and perspective. Wolfe’s photographic mission is multi-faceted. His vision and passionate wildlife advocacy affirm his dedication to his work. By employing artistic and journalistic styles, he documents his subjects and educates the viewer. His unique approach to nature photography is based on his training in the arts and his love of the environment. His goal is to win support for conservation issues by “focusing on what’s beautiful on the Earth.” Hailed by William Conway, former president of the Wildlife Conservation Society, as “the most prolific and sensitive recorder of a rapidly vanishing natural world,” Wolfe has taken an estimated one million images in his lifetime and has released over sixty books, including the award-winning Vanishing Act, The High Himalaya, Water: Worlds between Heaven & Earth, Tribes, Rainforests of the World, The Art of Photographing Nature, Pacific Northwest, Land of Light and Water, as well as numerous children’s titles, including O is for Orca and Animal Action Alphabet. Graphis included his books Light on the Land and the controversial Migrations on its list of the 100 best books published in the 1990s. In 2000 he published his signature work The Living Wild, which has more than 70,000 copies in print worldwide and garnered awards from the National Outdoor Book Awards, Independent Publisher, Applied Arts and Graphis. In 2001 WP published the award-winning Africa, and in 2003 Edge of the EarthmCorner of the Sky, which captured significant publishing awards, including IPPY (Independent Publishers), Benjamin Franklin (Publishers Marketing Association), and National Outdoor Book Award. Wolfe’s latest books for 2011 are Dogs Make Us Human, Uomini e Cani (Italy), Regard Sauvage (France), and Animal Art (Germany). 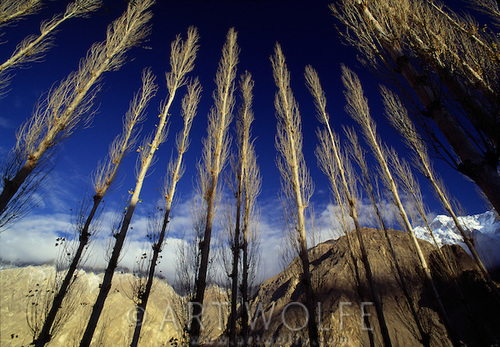 A new edition of The Art of Photographing Nature is planned for 2012. Canon’s elite list of renowned photographers Explorers of Light, Microsoft’s Icons of Imaging, Fujifilm’s Talent Team, and Nikon’s NPS Pros. Magazines all over the world publish his photographs and stories, and his work is licensed for monograph retail products as well as advertising. Numerous North American and international venues have featured his traveling exhibits, Travels to the Edge, One World, One Vision, and Beyond the Lens. His work is featured at The Natural Wonders Gallery in The Shoppes at The Palazzo® in Las Vegas, Nevada. 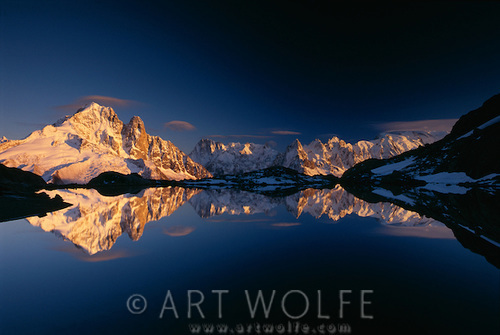 In 1997 Wolfe created a conservation-themed photo contest as “an event for the advancement of photography as a unique medium capable of bringing awareness and preservation to our environment through art.” Today the International Conservation Photography Awards draws entries from around the world and is exhibited and traveled by The Burke Museum of Natural History and Culture in Seattle. 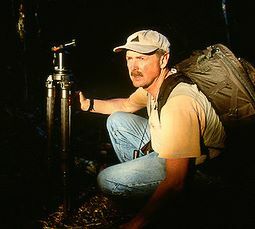 Wolfe has ventured into the world of television production with “On Location with Art Wolfe,” “Techniques of the Masters” and as host of “American Photo’s Safari”, which aired on ESPN 1993-1995. 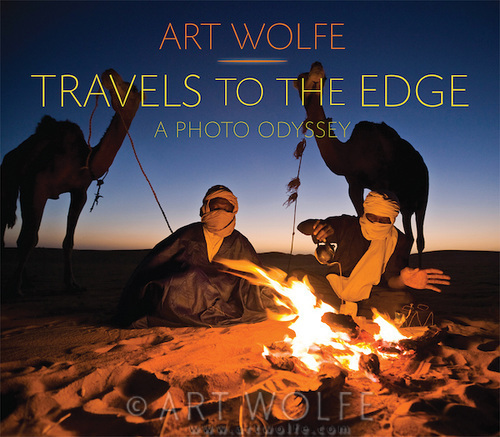 In May 2007 Art made his public television debut with the high definition series “Art Wolfe’s Travels to the Edge,” an intimate and upbeat series that offers unique insights on nature, culture, and the new realm of digital photography. The thirteen-episode first season garnered American Public Television’s 2007 Programming Excellence Award—unprecedented for a first season show. The thirteen-episode second season garnered five Silver Telly Awards, their highest honor, for outstanding achievement. It has been broadcast more than 180,000 times in the United States alone and is now seen in syndication throughout the world. Wolfe spends nearly nine months a year traveling, carefully researching the locations as well as pre-visualizing the photographs he wants to take. 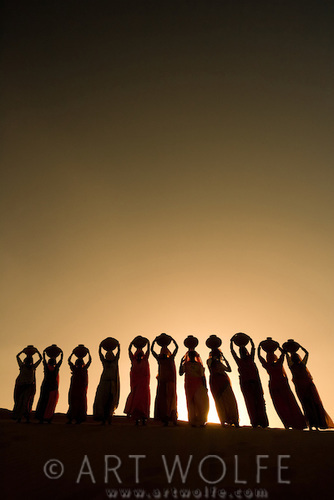 He leads photography tours and workshops around the world. He has a seminar series sponsored by Calumet Photo, and is a guest instructor for Phase One Digital Artist’s Series workshops. 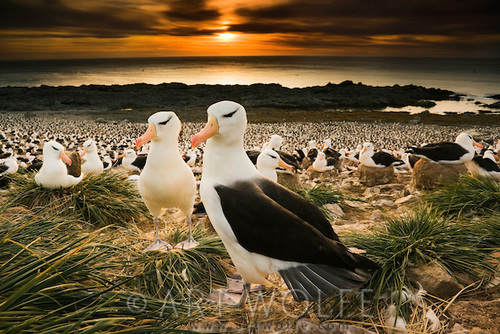 In 2012 he is teaming up with nature photography legends Frans Lanting and Tom Mangelsen for a limited series of workshops. The son of commercial artists, Wolfe was born on September 13, 1951 in Seattle and still calls the city home. He graduated from the University of Washington with Bachelor’s degrees in fine arts and art education; in 1999 he was named to the UW Alumni Association’s magazine list of 100 “most famous, fascinating and influential” alumni of the 20th century. He is an Honorary Fellow of the Royal Photographic Society, a Fellow of the International League of Conservation Photographers and has served on the advisory boards for the Wildlife Conservation Society, Nature’s Best Foundation, and Bridges to Understanding. He donates performances and work to environmental and educational groups every year; his lecture series is also in demand for corporate conventions and trade shows. Wolfe maintains his gallery, stock agency, production company and digital photography school in Seattle’s Pioneer Square district. We sincerely thank Art for being very kind in taking time off his busy travel schedule for answering our questions. We really appreciate his time and invaluable thoughts.